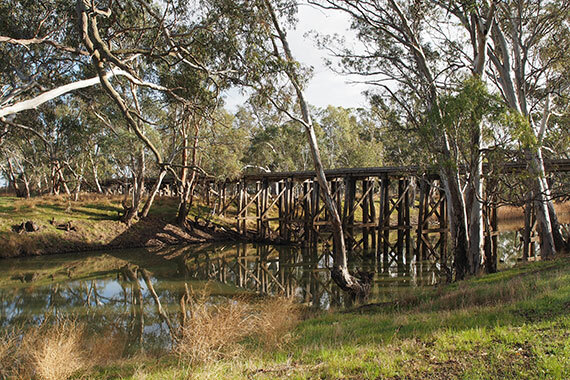 In the Wimmera system, environmental water has become more reliable since the Wimmera–Mallee pipeline was completed. Regular environmental watering has provided a lifeline to the river where below-average rainfall means very little water has flowed naturally into the system. Maintaining water quality and providing habitat for fish and platypus was the main focus of environmental watering in the Wimmera system in 2014–15. Clare Wilson, Floodplain and Environmental Water Management Officer at Wimmera Catchment Management Authority, said releases of environmental water into the drying Mount William Creek, Burnt Creek and MacKenzie River provided refuge pools for native fish such as southern pygmy perch, obscure galaxias, river blackfish and flatheaded gudgeon. "This was the first time that environmental watering targeted the upper Mount William Creek, which our monitoring tells us, along with the lower Mount William Creek, Burnt Creek and MacKenzie River, provides important habitat for a number of native fish species," Clare said. "Environmental watering essentially helped to keep water in these waterways until conditions cooled down and in some cases runoff from the local catchment took over." "We know from previous monitoring work that these actions are critical in sustaining these fish communities. Monitoring also showed that the region's small platypus population (link to feature story on platypus), which is mostly on the MacKenzie River, is slowly growing, which is very exciting." The environmental water releases had the added benefit of managing salinity levels at the bottom end of the Wimmera River. Monitoring also showed that despite major improvements in native fish populations, numbers of the introduced European Carp have remained steady since 2010–11.